Saint Ksenia is a fashion line brewed from the idea to create lasting luxury fashion pieces for the modern woman who values elegance and timeless classics. 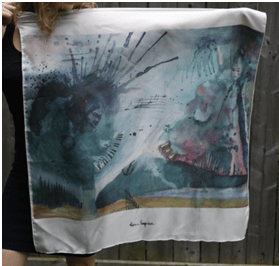 Founded by Toronto-based artist Ksenia Sapunkova, the brand creates ethereal images of magical realism using watercolour techniques digitally printed onto silk scarves. 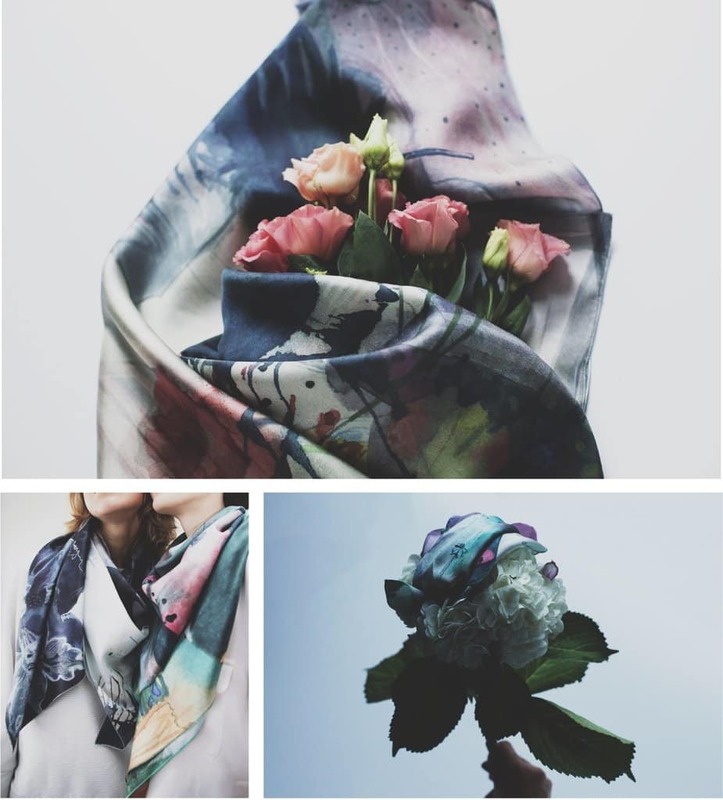 Each scarf starts off as a blank slate, with Sapunkova hand painting each design on watercolour paper first. 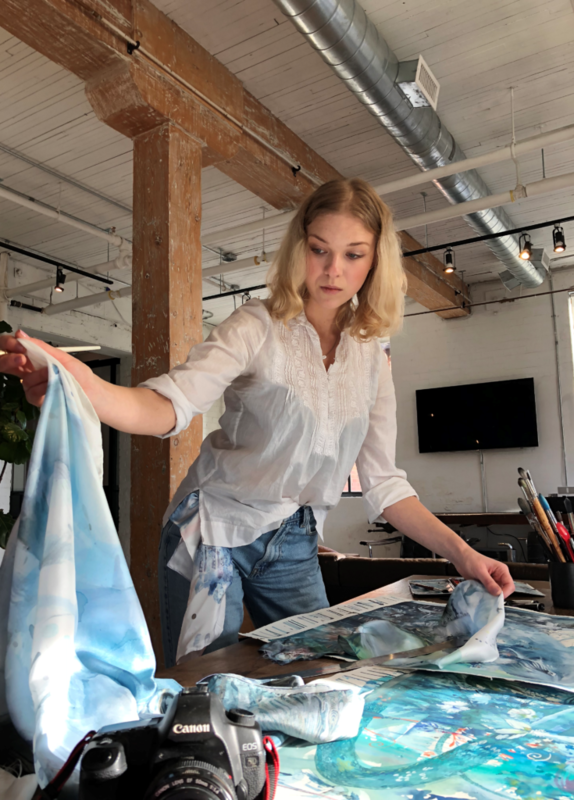 She then carefully scans the design and transfers it onto a piece of white silk charmeuse using a process called “reactive dyeing.” The scarf is triple-washed to ensure that it can withstand all wear-and-tear. Originally from Eastern Europe, Sapunkova came to Toronto in hopes of pursuing a career in illustration. Her studies in art and interest in the fashion industry ultimately sparked her passion to create Saint Ksenia. Her recent achievements include becoming a Toronto Fashion Incubator ‘Fashion Your Future’ Finalist in 2017. She got the chance to receive mentorship from industry professionals and was picked to showcase her works at the annual TFI Press & Buyer’s show. We caught up with Ksenia to chat about her inspiration, moving to Toronto and the first scarf she ever designed! What prompted you to move to Toronto to pursue Illustration? I finished my BA in Sculpture in 2008. Coincidentally, the timing matched with when my family received permanent residency in Canada. My mother worked really hard to get us to enter this country for which my sister and I are endlessly grateful for. 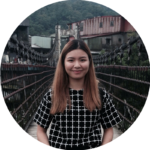 At that time I was 19, and curious as to what life abroad was like. It felt challenging but I was inspired by the opportunities in Toronto and learned about the art schools here. 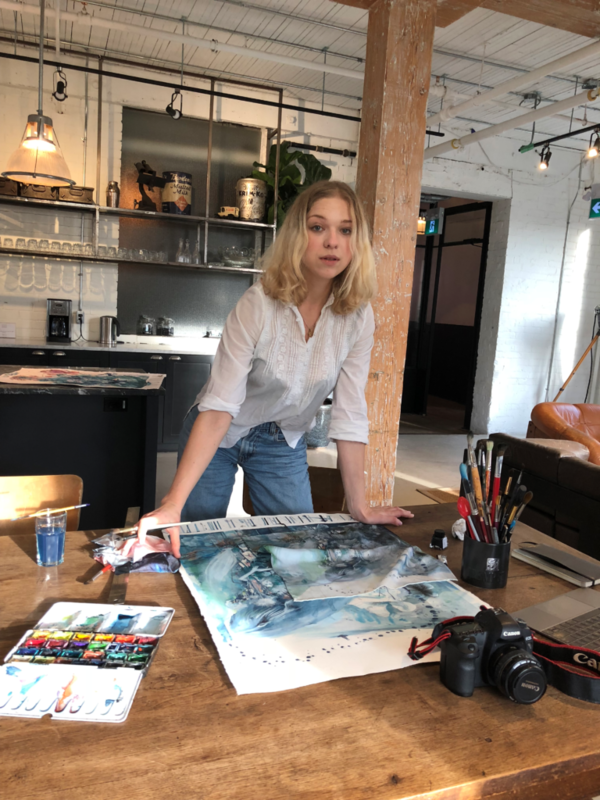 At first I was interested in OCAD, but when I travelled to Oakville, I felt an immediate connection with the place and the energy there. With a BA in Sculpture, do you find that it helps you design or get inspiration in any way? The art schools in Ukraine have a very big emphasis on an academic training in arts (which means that before we were allowed to sculpt, we had to draw models and prior to that we spent hundreds of hours drawing cubes, cylinders and apples.) I feel like sculpting from a real life model or object is the best way to understand shapes. This art has also taught me to think about the shadows and reflections of objects. Now when I paint, I feel like I’m carving into the paper using shades and colours. I don’t think my watercolours would look the same if I had never pursued sculpture. Take us through your first scarf design and what your inspiration was behind it. 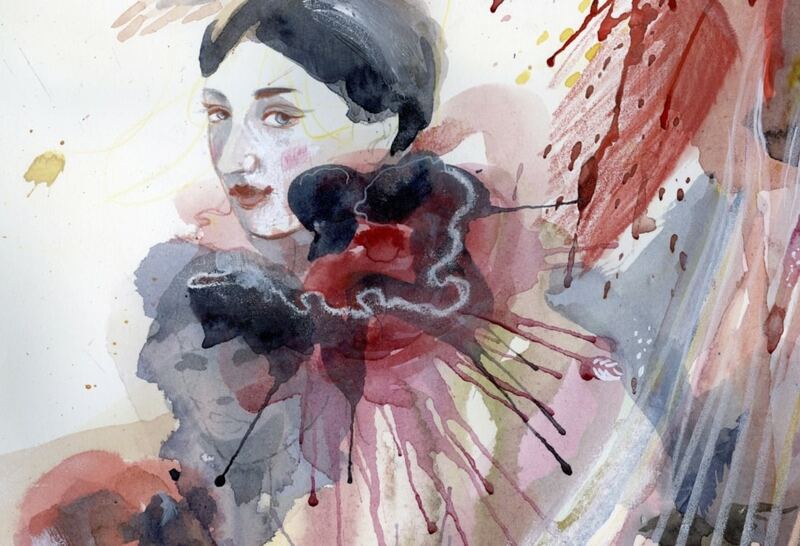 My first scarf was inspired by the painting I did shortly after my trip to Milan. I was overwhelmed by opera theatre La Scala and the beauty of singing. When I was there, I imagined Olga Peretyatko whom I had a pleasure to listen to in Toronto about 8 years ago. The painting doesn’t picture La Scala itself but was certainly influenced by it. I called it The music of your Soul. At that time, I didn’t have an idea on what it would turn into in two years from then, so I just placed a rectangular image onto a square piece of silk and printed it like that with white borders. Yeah, totally amateur! Saint Ksenia utilizes an eco-friendly process to transfer the print onto the scarves. Explain this strong philosophy and how you decided on using digital printing. When I studied painting, I realized that most of the production and painting can hardly be called eco-friendly. After every painting class, we had brushes to wash and the acrylic paint diluted in our water containers was poured into the sinks. So, my first step was to switch to watercolours. One box of paints lasts me for years because only very little of pigment is needed. When I started my research in textile design, I discovered that in the world dominated by fast-fashion and toxic fabrics, it is worth striving to provide the customer with a harmless alternative that will never damage even the most delicate skin. Being health-conscious, I chose silk because it is a natural fabric with 4000 years of history. Also, I wanted to place a high value on taking care of our planet. As opposed to some other methods, digital printing is a smart solution that doles out just the right amount of dye, ensuring that very little ink is wasted. The eco-friendly process is surprisingly low-energy for such a powerful technique, sparing even the most important resource of all: water. Do you have any plans to create other garments using this technique? Right now I am working on a line of simple summer dresses with fluid and graceful watercolour prints. Cushions for home decor will be available soon too. Being a Toronto Fashion Incubator ‘Fashion Your Future’ finalist, what was the journey like leading up to the Press & Buyer’s show? This four-month journey was exciting and also challenging. When I entered the program I had my collection and website ready, but it wasn’t working the way I felt it should and I was open to learn, change and improve. I was learning something new about the fashion business every day and I tried my best to incorporate it immediately. So it was a really busy time for me. Working together with my mentor Sarah Stevenson was one of the most inspiring and insightful experiences. I am deeply grateful to her for sharing her knowledge and helping me to learn how to tie the collection. I reworked so many things in my business including the name, and the website. The most valuable thing was to discover the core of my business and I am endlessly grateful for that to Susan Langdon and to TFI. Having designed logos and branding for companies as an illustrator, do you have any plans to expand your business beyond just scarves? I graduated as an illustrator and I love connecting with people through images. I use every opportunity to do that. This is how I came up with the idea for custom made scarves too. Right now, I am in the middle of a new exciting collaboration with a Toronto-based singer/composer, Anastasia Minster, for her limited edition vinyl. I’ve been lucky to work with amazing clients so far, and I hope it will continue that way. Lately I’ve been illustrating a lot for SHUTUP & YOGA, a new online magazine about health, self-development and yoga. I laugh so hard every time I sketch for their articles. How do you see tech changing the way traditional art is being made today? Today despite everything changing so rapidly, I feel the human need for traditional art is not going away. That being said, the tools are changing. The vision is what matters the most. 80% of my work is done traditionally, yet computers allow me more control over fine details. Sometimes I scan the original watercolour piece, edit it in Photoshop and print on giclee paper. I love it because it allows me to work over print with gold or other media. I also see technology as a tool that makes the process a thousand times faster and more sustainable. What advice would you give to someone wanting to start their own fashion business? I would suggest finding out first what the value that your brand is going to bring to this really competitive market is. Also, I would advise to immerse yourself deeply in the process. There are no shortcuts, but having right mentors will help greatly to get on track.